Los Angeles Overtime Lawyers & Meal/Rest Break Attorneys at Azadian Law Group, PC know that California’s wage and hour laws are constantly changing, especially here in Los Angeles and Pasadena where the city has recently increased the minimum wage. Today we are going to answer some of the most basic questions about overtime pay to help you determine your entitlements and to make sure that you are being properly compensated for your time and efforts. Overtime pay is required by federal and state laws. 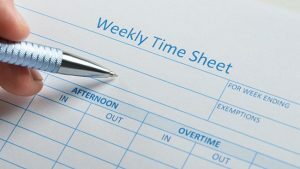 These laws allow the majority of employees to collect a 50% premium (or “time and a half”) should they work over a certain amount each day or each week, and in some situations a 100% premium (or “double time”). In some states employers are able to use the tips an employee receives as overtime pay. California law prohibits tips from being used as overtime pay and an employer must pay out overtime pay separately. Employers who are covered by the federal Fair Labor Standards Act (FLSA) must pay overtime. Typically a company would be covered by the FLSA if they generate $500,000 annually in sales. California overtime law also protects employees who work for small or family-run businesses. Am I an employee entitled to overtime? Most employees in California are entitled to overtime pay, there are some important exceptions. An “exempt” employee is an employee whose job does not qualify for overtime protections because of the kind of work the employee performs. Just because your employer says you are exempt does not make it true and many employer’s misclassify non-exempt employees entitled to overtime pay as exempt employees. Also, just because you are paid a salary does not automatically make you an exempt employee. The employer has the burden of proving that the employee was properly classified as an exempt employee. See Martinez v. Joe’s Crab Shack Holdings, 231 Cal. App. 4th 362, 375 (2014) (“Exemptions are narrowly construed and, as affirmative defenses, must be proved by the employer. . . . Moreover, because the elements of the exemption are stated in the conjunctive, all criteria must be established for the exemption to apply.”). You must also meet the “salary basis” test, which means that you also must receive a salary that is at least twice the minimum wage for full time work. Employees who perform, only under general supervision, work along specialized or technical lines requiring special training, experience or knowledge. Such employees are often described as “staff employees,” or functional, rather than department heads. They include employees who act as advisory specialists to management, or to the employer’s customers. Typical examples are tax experts, insurance experts, sales research experts, wage rate analysts, foreign exchange consultants, and statisticians. Such experts may or may not be exempt, depending on the extent to which they exercise discretionary powers. Also included in this category would be persons in charge of a functional department, which may even be a one-person department, such as credit managers, purchasing agents, buyers, personnel directors, safety directors, and labor relations directors. Employees who perform special assignments under only general supervision. Often, such employees perform their work away from the employer’s place of business. Typical titles of such persons are buyers, field representatives, and location managers for motion picture companies. This category also includes employees whose special assignments are performed entirely or mostly on the employer’s premises, such as customers’ brokers in stock exchange firms and so-called “account executives” in advertising firms. In contrast, if the employee has little or no discretion and must follow specific guidelines in performing their duties, they are unlikely to be exempt employee (meaning they should be paid hourly with overtime and not just a salary). For example, in McKeen-Chaplin v. Provident Sav. Bank, No. 15-16758, 2017 U.S. App. LEXIS 11950 (9th Cir. July 5, 2017), the Ninth Circuit Court of Appeal held that mortgage underwriters at a specific bank should have been paid hourly with overtime. The Court reasoned that the underwriters’ primary duties did not relate to the management or general business of the employer. Instead, the Court found that the underwriters’ duties were “production rather than administrative work.” The production aspect of the job was that these underwriters sold mortgage loans. The Court also ruled that the employees did not have significant discretion in performing their duties because they were required to follow company guidelines to determine if the loan was acceptable from a risk standpoint. Remember, just because your title contains the word “manager” does not mean you are automatically an exempt employee. You must also spend at least half of your work time performing duties that are typical of your profession and must also meet the “salary basis” test, which means that you also must receive a salary that is at least twice the minimum wage for full time work. How Overtime Pay Is Calculated? In this situations you would be entitled to 1.5x your regular hourly rate. If you have worked more than 12 hours in a work day, then your overtime rate would be 2x the regular hourly rate. Calculating overtime pay for a salaried employee is a bit more complicated than a non-salaried employee. To start, convert your hourly rate of pay by taking your weekly salary and dividing it by 40. Recently, the California Court of Appeal ruled that if the employee does not work more than 6 hours in the day, the meal period can also be waived through an agreement between the employee’s union and the employer (the agreement between the union and the employer is referred to as a collective bargaining agreement). See Ehret v. Winco Foods, 2018 Cal. App. LEXIS 708 (Aug. 13, 2018). Employees are also entitled to a second 30 minute break if they work for 10 hours a day, unless the workday is no longer than 12 hours. The second meal break can be waived by agreement between the employer and employee only if the first meal break was not waived. A paid meal break is permitted if the nature of the work prevents the employee from taking a break, and all parties agree in a written contract that it will be paid and the contract allows the employee the right to revoke the agreement. If you are required to be “on call” or carry a phone or pager during your meal or rest period, you may be owed an hour of pay for each meal or rest period. The California Supreme Court recently held that security guards were owed compensation for meal and rest periods where they were required to carry a pager and respond to potential issues, even if they did not receive such calls during each rest period. See Augustus v. ABM Sec. Servs., Inc., 2 Cal. 5th 257, 273 (2016) (during meal and rest periods employers must “relinquish any control over how employees spend their break time, and relieve their employees of all duties—including the obligation that an employee remain on call”). Depending on the nature of the job, the employer and employee can agree that the employee will be paid for an “on duty” 30 minute meal/lunch period. An “on duty” meal period is allowed under California law only if the type of work the employee is hired for prevents him or her from being relieved of all job duties. Examples of such jobs include an employee who is on a shift alone or a security guard who is working alone. For such an on-duty lunch period there also must be an agreement in writing between the employer and the employee stating that the employee agrees to an on-the-job paid meal period. This written agreement also must state that the employee can revoke the agreement at any time. See Wage Orders 1 –15, Section 11, Wage Order 16, Section 10. All employees are also entitled to a paid 10 minute rest period for each four hours worked. This rest break is in addition to time taken by the employee to use the restroom. To the extent it is practical, rest break should be provided in the middle of the four hours worked. However, a rest period is not required for employees who work less than three and a half hours in a workday. Certain potential exceptions also exist for employees of 24 hour care facilities such as nursing homes. Another exception exists for swimmers, dancers, skaters, and other performers engaged in strenuous physical activities who must have additional interim rest periods during periods of actual rehearsal or shooting. What If A Lot Of Employees Are Denied Meal or Rest Breaks? Depending on the number of employees impacted, bringing a wage-and-hour class action may also be warranted for failure to provide compliant lunch and rest breaks. Employees who believe that they are entitled to overtime generally or premium pay for not being provided compliant meal/rest periods generally have 3 years under California overtime laws to collect overtime pay for the work they performed. This may be extended to 4 years under California’s Unfair Competition Law (UCL). Calculating overtime pay and the rules relating to meal and rest breaks can be complex and requesting it from an employer can be intimidating. The Azadian Law Group, PC offers free case evaluations to anyone who is trying to determine their overtime pay and whether or not they are being fairly compensated for their time at work.